One of my very favorite mediums, anime-related or not, is fan fiction. It’s a way for writers of all skill levels and ages to express their creativity and imagination using their favorite characters. There are quite a few fan fics out there related to both anime and Christian spirituality, but to be frank, most are poorly written. So when I found a good one – a really good one – I had to share it with everyone. “Apostle’s Sword” is a retelling of the first two Rurouni Kenshin OVAs (which are stunning pieces of work, by the way) using a Christian background based in history and the Bible story of Saul’s conversion from a zealous anti-Christian to a follower of Christ. The fanfic is four chapters long, and I’ll reveal one chapter per week, each Thursday, until we finish. The story is written by a freelance writer, melcon, who is amazing. It also doesn’t preach, so I highly recommend all readers out there, believer or not, to take a read. Beneath the Tangles is proud to present, with permission, “Apostle’s Sword” – enjoy. 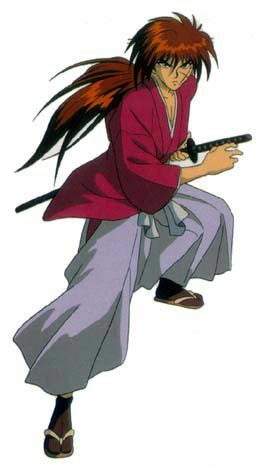 Author’s note: The following story is a crossover between Rurouni Kenshin and the story of the Apostle Paul from the Bible. You can read the Apostle Paul’s story in Acts 9 (originally he has the name of Saul, and it is later changed to Paul). Saul was a great persecutor of Christians until he encountered Christ on the road to Damascus. A crossover of him with Kenshin seemed to work – enjoy! I remember. It was so long ago. It was like yesterday. It was 1853, the arrival of Commando Perry and the opening of Japan to the West that had been the pivotal point. None of us suspected that the Christian religion the ganji brought with them would spread through our nation like blood through water. From east to west, scores of people were suddenly aflame with new and dangerous ideas. These new-forged rebels, these Christians were willful and stubborn, brazenly flouting laws against their books, gatherings, and ideas. They did not whisper but shouted loudly, proclaiming equality for all and obedience to one God, not to parents, the clan, or the government. They were dangerous and numerous. But they were all capable of bleeding and dying, and many did by my sword. For that, I was named Battousai, Demon of Kyoto and Slayer of Christians. How tragically true my master’s words were, but I did not comprehend their full meaning until the day of my inauguration as hitokiri. My first target was a local pastor, an outspoken leader who was gathering new believers to him by the hundreds. I found him in the woods, on his knees, in prayer, I assume. I was silent when I approached him, I was certain of it. There was no way that he could have heard my approach. But he sensed me anyway. Rising to his feet, he faced me calmly. Though small and wizened, his ki was strong and he did not move as I cut swiftly, slicing open his torso from shoulder to hip. The god of this man did not save him nor strike me down for killing him. I stood in the woods, blood-splattered, staring at the body at my feet. Even in death, he looked calm. When I expected emotion, there was nothing – I looked at the body with only a cold, detached curiosity. The years of training had held true. I had become hitokiri. “Baka! You’ll slaughter thousands just for your principles?” my master Seijuro spat at me, disgust written on his face. I had left my master that cold, snowy day to join the Ishin patriots, those sworn to stamping out these rebel Christians and restoring our country. The Christians were an enemy like no others: we could not face them across the battlefield for they would not fight us. Many ran and hid like rats, carrying out their prayers and preaching in hidden forests or abandoned buildings. Others were braver, marching and speaking in the streets, boldly teaching their vile practices and beliefs to all who would listen. Many did. For it, they died. A few tried to fight back, but their feeble skills were no match for my demon blade. Only one time did a sword wielded by a Christian leave its mark on me. It was the bodyguard to my target, the Christian Shikoru, who had set up a printing press for the Japanese version of the Christian Bible and was smuggling thousands of copies of it around Japan. Foolishly traveling with only two guards, Shikoru was easy to eliminate. Yet, one of his bodyguards, a young man that I later learned was named Kiyosato, had a will to live that was more powerful than his inept skill with the blade. I cut him down as easily as a blade of grass, yet he marked my left cheek, leaving a vertical slash that kept stubbornly reopening in the coming months. As time passed, some men began to grasp that there was power to be had in this struggle between the Christians and the Ishin. Amidst the ordinary Christians, those who would not fight back with weapons, the powerful Shinsengumi arose, and they rebelled against the Ishin, claiming that their god was calling them to seize control of Japan and establish a new holy land in our country. Many young Christian men flocked to the Shinsengumi banner, eyes and hearts aflame with zeal. “Our country is falling apart because of these Christians,” Katsura’s hand clenched on the katana at his side. “Thousands of them are abandoning the farms and rice paddies to try to get others to follow their faith. The price of rice has tripled in the past two years because of this. Because of this, there are more hungry bandits and ronin pillaging villages and waylaying travelers. Keeping our roads safe is impossible now. Many of these Christians are abandoning their clans and defying the orders of their kinsmen. They even refuse to commit seppuku if ordered, and whole families are being wiped out for the disobedience of one. Taxes are not being collected. The Shinsengumi grow stronger every day and are challenging us across the battlefield. Hundreds die daily. The only way we can keep our country from going up in flames is to destroy these Christians: if we destroy them, the Shinsengumi will fall. It must be done. Will you do it? I did. As hitokiri, I targeted the Christian leaders and preachers. They were astonishingly easy to kill: few wore swords or even tried to defend themselves. They embraced death, many of them showing fortitude and calmness in the face of their own deaths that even samurai would envy. I killed and I killed, believing firmly that it had to be done, knowing only the burning desire to see Japan restored and this fatal canker of Christianity eradicated from our country’s face and memory. Yet each new killing was another weight to the invisible chain around my soul. I stank of blood, and all of the sake in Japan could not wash the taste of it from my lips, try as I might. I began hearing reports that troubled me, descriptions of mass executions of Christians, Ishin patriots ambushing secret meetings of Christians and slaughtering them down to the last child. As hitokiri, I was exempt from these killings since my blade was reserved only for top operatives, and glad I was of this: the rumors brought too many memories to the surface, memories I had long hidden. Moonlight on black hair smelling of perfume. A frantic whisper, “Shinta, Shinta, you must listen to me! You must live for us!” Blood falling like cherry blossoms, pattering gently on the dark grass. A heavy sword in my child hand, death all around me. Drinking was the only way I could keep the demons at bay, to blot out the screams and blood and the memories. But even sake could not silence the nightmares, and I could not be drunk all the time. I had work to do, as vile as it was, and it demanded sobriety. During these times when I was unaided by the comforting numbness of sake, the ghosts of the past haunted me. I remember one particular target most clearly. He was still in the prime of his life, a strong, healthy-looking man who likely had a wife and children waiting for him at home. When he saw me, he knew at once. Many of them did. I swear that his face was almost grateful, as if he was seeing something that he had long waited for. He fell, graceful and calm, lying at my feet in a pool of his own blood. I turned to leave. “Wa…wait,” a barely perceptible voice spoke. I turned, surprised to see that he was still moving. He was on his stomach, trying to prop himself up. A hand stretched out towards me, not imploring for help but reaching as if he wished to make a contact with me. His eyes were calm, even as his body spasmed in pain and imminent death. “I…I..for…forgive…you…my…my son,” he gasped out before sagging to the ground motionless. My son. No one had called me that since I was a child. I barely remember my father, a quiet man who had poured the entirety of his strength out on a meager plot of land, toiling mightily to support his family before a plague took him and my mother from me. My son. Master Seijuro rarely reverted to the name he gave me, Kenshin, preferring deshii if he was pleased or baka deshii if he was angry with me. Who was this man to call his murderer “My son”? I did not know. All I knew was the weight of the sword at my side and the multitude of ways it could sever body and spirit. I was hitokiri. Killing was all I knew. One night as I left the akebeko, numb from too much sake and bad memories, I was accosted. A dark shape in the shadows of the alley addressed me. “Kenshin Himaru,” a voice said across the sound of pattering rain. “I am,” I replied, wondering with a cold curiosity who it was. Had the Christians decided they had had enough and had sent an assassin after me? Was this a member of the Shinsengumi? It didn’t matter. Even drunk, I was still Battousai, the demon of Kyoto. “You will pay for the lives of the Christians you have taken. I am the hand of God and will strike you down here,” the shadow responded darkly and attacked. He was good, quite good, and I was drunk. But I defeated him anyway, leaving his slashed corpse in the mud of the streets. Panting for breath and trying to shake myself free of the sake’s grip, I looked up to see a woman standing not far from my path. The blood of my opponent had splattered across her umbrella and kimono, leaving faint pink marks on her white cheeks. “You…” she said in a detached, almost dreamy voice. “You made it rain blood. Just like they say in the stories…Just like in the Bible…” she said, swaying on her feet. Bible. This woman was a Christian. She had seen me kill. My hand tightened on my sword. Should I…eliminate her? I stood frozen, undecided. She moved towards me, one frail hand extended outward. Rain splashed on it, throwing shimmers on her skin. But as she moved forward, she swayed, then slowly sagged at the knees. I caught her before she plummeted into the mud. White plums. Her perfume floated up from the warm recesses of her clothing and skin. As I held her in my arms, she seems like a dead thing, as lifeless as one of the many corpses I had left behind me. I had never lifted my hand against a woman. I wasn’t entirely sure that I wouldn’t do so against this one. Instead, I took her to the inn where Katsura and his men were stationed. The innkeeper, an inscrutable woman with a sternness that rarely softened, almost turned the girl away at the door, but finally relented: she stripped the girl of her wet things, dressed her, and put her to bed. I spent the evening in her room, watching as a shaft of moonlight illuminated her skin as I idly fiddled with the toy top I carried with me wherever I went. Christian. By all rights, I should have killed her. I thought of it throughout the night as I sat with my back propped against the wall. I had killed scores of her kind before; that was my purpose as hitokiri. But this was different. She was no leader, no rebel, nothing in her represented a threat to the future of Japan. She was just a stray wanderer on the streets of Kyoto, most likely only looking for a safe place from the clash of Ishin and Shinsengumi and the violence that raged in our land. If she was to die, I determined, it would not be by my hand. I found her in the morning; she was carrying dirty dishes from the dining room where the other warriors ate. I beckoned to a small room, “Come here,” I said. She obeyed, standing calmly in the room and looking at me with deep, black eyes. Her perfume caught my nose, disconcerting me in a way that I could not identify. “You’re welcome,” I responded. Silence reigned for a minute or two, and finally I hissed out, “You’re a Christian?” through clenched teeth. “You knew what I was last night, and yet you did not kill me,” she responded with more courage than I expect of so delicate a thing. “Are you not Battousai, the killer of Christians?” I froze, my hand still grasping her arm. Finally I dropped it. “Tomoe,” she replied, then slipped quietly out of the door. “Don’t you have family?” I questioned. So it was settled. Tomoe stayed, a white butterfly in the inn that fluttered delicately from room to room cleaning and carrying and tidying up. Her elegance kept the other men at bay, and the threat of my sword was more than enough to discourage other Ishin members from taking advantage of her. Instead, they began teasing me about her, snickering about “Kenshin’s woman” and making suggestive comments when I was within earshot. I don’t know why this roused my temper so much, but it did. At night, I had my duties of blood, and the stark presence of death was my constant companion. Some of my targets began to include Shinsengumi leaders; they were more difficult to kill than the pastors and ordinary leaders, but they died as well. One night, it all changed. Izuka, Katsura’s field captain, had given me a new target: another pastor with a growing group of Christians mustered around him. I surprised him at his home, huddled inside with a group of his followers, teaching them. I had meant to take him alone, but the others with him saw me, and I had no choice but to kill them all. They all died, offering no resistance to my killing blade. Within moments, I was the only living thing in the dark home, splattered with blood and feeling the familiar numbness that settled over me in the aftermath of a killing. Yet this was worse, far worse – a few of the people I had killed were young men, not even full-grown yet. Had I fallen to this, killing adolescent boys in a home? Leaving the house, I stepped out into the street and into what seemed to be the light of day. A bright light shone, so dazzling that I threw up my hands to shield myself. A strange weakness overcame my knees, and I found myself sinking to the ground, unable to stand for the dread of some unnamed wonder. I expected an attack, an onslaught but my hands were suddenly frozen and useless, and years of training were not enough to force them from their stupor and wrap them around my sword handle. Huddled on the ground, shaking with a strange fear, I heard a voice. It was unlike any I had heard before: powerful, wise, quiet, masterful, sorrowful. I did not hear it so much as I felt it through my bones and skin, reverberating in my very core. Scrabbling on the ground, I clapped my hands over my ears, but it was like trying to hold back a tsunami. There was no escape – I was bathed in penetrating light and it its presence, Battousai, Demon of Kyoto, was trembling in fear. “Who are you?” I screamed, heedless of anything but my own terror and dread at the voice. Jesus. I knew this name. The Christians claimed that their god had a son who had walked the earth and died as a man. I had scoffed at this tale, scornfully wondering how anyone could worship a god so weak that he would let his son die. But there was no weakness in the voice that spoke to me; indeed, I had never experienced such power before. I could scarce move a muscle. “What do you want from me?” I gasped, certain that the voice had only one fate in mind for Demon of Kyoto. Its response surprised me. “Go to Tokyo. There you will find a man named Ananias, a blade maker by trade. Find him.” Suddenly, I felt a cool breeze on my cheek, as gentle as a mother’s touch. “Do not be afraid,” the voice said in a tender whisper, and suddenly, it was gone, leaving me behind gasping and trembling in fear. I kept quiet about this event, speaking of it to no one. To go to Tokyo, I would have to defy orders, abandon the Ishin patriots, become traitor. I was hitokiri and as the Demon of Kyoto, it was my duty to slaughter all who claimed the name of Christian. Yet after my encounter with Jesus of Nazareth, I knew that I could never again draw my sword against Christians. A few days’ time brought my opportunity. Tomoe had asked me to accompany her to the Yian festival. As we sat drinking sake, Izuka rushed in, dragging us both out into the streets, yelling that Miabi and the Shinsengumi were posed to attack the city and set it aflame during the festival. He was correct – within a few hours, blue and white coats were everywhere as Ishin and Shinsengumi fought in the streets, leaving them slick with blood and roaring with fire. In the ensuing chaos, Tomoe and I managed to escape, me with my telltale red hair bound up under a hat. I tried to think of a safe place I could leave Tomoe, but she wanted to accompany me. I hoped she was right. I also hoped that Katsura assumed I had died in the ensuing turmoil. I doubted that it would cross his mind to think that I had turned traitor and to come looking for me. Indeed, I was in disbelief myself. Were it not for the fact that I knew beyond a shadow of a doubt that I had to go to Tokyo, I would not have even entertained the idea of leaving the Ishin. But my encounter with the Jesus of Nazareth had shaken me to the very core. I had not been able to sleep since that night, and the sword at my side seemed to be as heavy as an anvil, weighing me down with the innocent blood that stained it. No matter what stood in my way, I knew I had to go to Tokyo and face this man Ananias. The trip to Tokyo was long and hard; the roads were filled with people escaping the turmoil of Kyoto. For that, I was grateful: Tomoe and I blended easily with the crowd and looked no different than the other haggard families around us. A few times, I glimpsed fellow Ishin members, but I kept my head down, and Tomoe and I passed by unaccosted. Tomoe was right about us: traveling as husband and wife made us less susceptible to scrutiny. As far as the exhausted, frightened people around us knew, I was just another swordsman with his wife in tow looking for a safe place to be. I was one of the few swordsmen in the crowd, and soon a small group of people had attached itself to Tomoe and me, hoping, I suppose, for protection from my blade. They fed us without asking for payment and invited us to sleep around their fire at night. Twice, we encountered a roving band of ronin, but they backed down under my hard stare, and my sword did not leave its sheath the entire trip. I was oddly glad for that, and something in me knew that I could not continue to shed blood any longer. As Tomoe and I moved from Kyoto, I felt myself distancing from the manslayer, as if I was leaving Battousai behind me. What was in front of me, I did not know. Despite our hardship, Tomoe showed little sign of strain. No matter how long the day dragged on, she was always a few steps behind me. I tried to keep the pace moderate both for her sake and the sake of the group who was tagging behind us, but my eagerness to get to Tokyo was only matched by my dread of what I would find once I got there. I tried not to hurry, tried not to unnecessarily exhaust Tomoe, but I doubt she would have raised one voice of protest had I set a faster pace. She was my shadow by day; at night, she quietly assisted the women of our group in preparing food and tending the children. During the day, I had the motion of travel to quell my restlessness. Nights were the worst for me: when the other group members were resting or talking quietly among themselves, I paced like a caged beast. I told myself that I was merely patrolling, for the way had grown increasingly dangerous, and the group grew fearful as night fell. But in truth, I was impatient to get to Tokyo, to face this Ananias and learn more of this Jesus of Nazareth who had flooded me with his light. To see if there might possibly be redemption for the Demon of Kyoto, although I could not see how any man or power could cleanse me of the stink of innocent blood. At night, while everyone slept, I stood alert, not willing to lose myself in the screaming shadows that lately had become my dreams. Often, I would watch Tomoe as she slept curled up on the ground; it was almost laughable that she could sleep soundly in the presence of Battousai, Slayer of Christians. Although I begun to hope that perhaps in the future there might be a way for me to set aside my sword and find a new way to live, I knew I would willingly, even gladly, loose my sword upon anyone that threatened Tomoe. She stirred troubling feelings in me, things that I had no name for and found both appealing and repellent. I wondered if there might be a safe place for Tomoe once we reached Tokyo, if perhaps I could find a group of Christians willing to care for her and keep her safe. But I had to admit to myself that although I worried over my ability to care for her and keep her safe, I was strangely loath to leave her behind. Tomoe’s presence, her fragile strength and calmness, was as a wall between me and madness. Without her, I do not know if I would have had the courage to face this Ananias. Had I left her behind, I think I might have fled the wilderness and become ronin. I did not. With Tomoe a few steps behind me and the ragged crowd at our heels, we made the long, dangerous journey to Tokyo and whatever lay for us in that city. Isn’t it? I really enjoy this story – it’s a well-done piece of writing, regardless of it’s Christian overtones. But I really commend Melissa, the author, because I’ve never read another really good anime fanfic that involves Christianity. I’ve tried to think of a couple things, but it never turned out good. A really creative piece, right? I’m very proud to repost it here on our blog.